Hello! This is largely a copy of a post we made at our Incubator page. Still, the more people have this information, the better. Here is a short page of exercises to teach you the alphabet (a video by ShadyArc is also available, though a bit fast-paced). You can also read about it at these two pages. Depending on how the situation unfolds, you may or may not immediately see Russian letters in your lessons. Duolingo uses a Latin transliteration by default. If you cannot see Cyrillics but wish to, use the small button at the top to switch to Russian. It will read Aa or Яя. Check the Microsoft site for a more thorough guide. Or, in more detail, HERE. Now, let us discuss different keyboards that exist. Russians do not use special rocket-shaped keyboards to type. After all, a normal keyboard already has over 100 keys, why not just paint their letters there, right? the standard (ЙЦУКЕН) is what Russians actually use. It makes sense if Russian is your love for life or if you have easy access to Russian keyboards (stickers?). Or maybe you live or plan to live in Russia, eh? For obvious reasons, it also makes total sense on a phone or a tablet. They have no physical keyboard anyway! Besides, they might turn out to be less customizable—but a standard keyboard is always there. a phonetic keyboard (say, ЯВЕРТЫ) which sort-of-matches Russian letters to Latin letters close in pronunciation (also maps extra keys somewhere). I think, these layouts are just fine if you are moderately interested in Russian but that's it. A phonetic keyboard has an obvious advantage if your physical keyboard does not have Russian letters. There are even tools to create your own layouts: for example, http://www.keyboard-layout-editor.com/#/. You can also use Google Input Tools. Now there is a chrome extension that changes the layouts automatically as your exercises require English or Russian input. Thanks to FelixAuer. An image or printout of the key-map is better than labeling the keys, and you don't have to move your hands to read it. Don't look at the keys, look at the reference card. Keep your fingers on the home keys ready to type. If you are having trouble finding your place: There are two keys with index marks you can feel with your (index)fingers, mark those keys in your image. This is great, Nart! And very helpful. It goes directly to my bookmarks. Спасибо! Four days after finding your comment, I'm already touch typing cyrrilic! Of course, I already knew touch typing in qwerty. But to let other people know, it took me no more than an hour a day. I still make some few mistakes (but the finger is right almost always) The efforts really paid off! 4 days, 4 hours... 4 lingots for you!!!! It is all in Russian. Wasn't much help. By the time my Russian is good enough to figure out what their approach is, I will already have worked out a different solution. Hi there, the site is now translated to English and btw is very well prepared. You probably would like to know that :) I'm going to finish my russian touch typing course there. Yes. I looked at their English language course enough to get the basic points about the page and started using the Russian. At the beginner level there are only a couple of things you need to know about the page anyway. I am surprised at how difficult I'm finding it to make real progress. I'm using Memrise and Babbel just to stay acquainted with how the letters are used. Once I have the keyboard down, I will go back to Duo Russian. Keyboard not an issue. Duo Russian excellent for my purposes. Memrise and Babbel too slow for me because I am using mnemonic practices to advance at a faster pace. Still slow but faster than vocab repetition methods. Thanks. I took a QWERT course 15 years ago. This set position hurts my wrists but I appreciated the link for practicing Russian in small sections. yeah, i used sense lang to learn to type in russian, and i used typingweb to learn to type in english (typingweb is better but it doesn't have russian.) after typingweb i was able to type 100+wpm and after learning to type in russian i have a 70wpm english average. it's a tradeoff to type in multiple languages. I agree about using an image of the keyboard. I am uploading the screenshot of the Russian keyboard that I use in case it's helpful for anyone else. I put red squares (somehow appropriate ;) around the index finger keys. I print it out, fold it down, and keep it at the top of my keyboard. PS You can switch between keyboards with left Alt-Shift pressed simultaneously (at least on my PC with Windows 7). When on windows, type Win+r, type in osk (on screen keyboard) and Enter. Windows will show current keyboard layout. Ah yes that is very helpful. Very useful! Have a lingot! Sounds like a good idea so I'll give it a try, though for now just using a virtual keyboard. Actually, your way is probably better for a lot of people. I know the included on-screen keyboards in Windows and Ubuntu/Linux show the current key-map. If have room on your screen and don' t need to mark your place, just turn on the on-screen keyboard and use that as a reference. I know that-for at least Windows 8 and 10-there's a "Fade" button that makes the on screen keyboard into a semi-transparent overlay. The button appears after enabling it in Options > "Show keys to make it easier to move around the screen". It goes opaque every time Ctrl, Shift or Alt is pressed though. It can also be docked with a button that appears after enabling the same setting, but then it cannot be resized horizontally. I'm sure there are alternatives, but that's just what I use. At first I just typed on the virtual keyboard but after your post I have now diminished it in size and put it in a corner of my screen and using it as reference. Good way of getting acquainted with where the Russian keys are. And ofcourse always at hand. A printout might get misplaced. I've personally been using the Mac OS virtual keyboard when doing DL on the web, and of course it is a virtual keyboard on iOS as well, but my typing was very difficult. I recently ordered an overlay keyboard for my Macbook Pro and it works really great. I type a lot faster now. 715 streak? Now that's dedication! I definitely like the idea of this! I normally use Cyrillic characters in lessons, but I like to switch between the Cyrillic and Transliterated views to help me better associate the letters with their sounds. Unfortunately doing this clears the answer box, if I've already started typing there. Is there any chance this could be fixed so that switching from one to the other doesn't clear what you've typed? In what I think is a related vein, it'd also be nice to be able to switch between them after the answer is in. As filipmc said, this has already been answered elsewhere in this thread. That said, at the top of the lesson panel there's a button labelled Aa/Яя. You can use this to switch between the transliterations and the Cyrillic characters. If you are using the Mobile Web version of duolingo, you may need to start a lesson on a desktop sized browser in order to change it. Once changed there the change should also affect the Mobile Web version. Mmmmm, when I press the Aa button, it just makes my letters larger or smaller. Not Cyrillic. Мне жаль. try alt shift or have you already or do you have it? I have never found that/ seen that button anywhere and I've looked and looked. On Windows, laptop. Please can you tell me exactly where it is? Read the sticky post at the top of the Russian forum. Actually, this is its thread, so you only need to scroll to the top of this and read the post above; these are all comments on that post. It's very interesting to see so many intelligent & supportive people in one thread. The idea exchange I've been able to experience through Duolingo is unequivocally one of the best experiences of my life. It's been helping me get a bit smarter, but more than that, it's been helping me emotionally. I've been going through some stuff, life can be difficult. It's obviously not always easy to be a person, but this is such a positive outlet. It makes me incredibly happy and causes me to feel hopeful/optimistic about the future as well. I think Duolingo is one of the greatest, most ethical & most important historical events against all known human achievements. I love & respect how Duolingo is changing our brains & the world for the better. ~ So... I initially created this comment three years ago. I've had to overcome a lot of weird obstacles since then. I wound up couch surfing with an L2 Japanese speaker, so I shifted my focus in that direction in order to make the most of our being in each others lives. But my interest in this Russian course never dissipated. So I've finally begun. It's a dream come true. I started using some other education apps to do some prep with the hope of preserving heart pieces (because I'm a weirdo). I've been color coding my lessons. For instance: I invert my phone's color display when I study Japanese. So if one of the same characters pops up in one of my Chinese lessons there's no confusion whatsoever. It's as if the data is synesthesia(ed) as it's deposited into long term memory (or crystallized). When I add Spanish to my language regimen, because of its substantial intelligibility with French: I'll invert my device's display whenever I endeavor at Spanish, since I have no fear of confusing Spanish with Japanese. If I wanted to study Italian, Portuguese or Romanian in addition to French & Spanish... I'd use a different color filter entirely, or perhaps shift everything into greyscale. This tactic has been working so well for me that I'm considering purchasing 'color therapy' sunglasses in as many different shades as I can find. My Duolingo XP doesn't tell the whole story as far as the depth of information I'm trying to keep organized. Like many of you: I enjoy Alison Courses, Khan Academy, Lingvist, Mango Languages, MIT OpenCourseWare, SoloLearn, YouTube & many more resources! So strategies having to do with cognitive organization are quite interesting to me! Words really cannot express the gratitude I feel over all the hard work that has gone (& continues to go) into developing all these beautiful course offerings. It'll get rolled out to the apps when the number of reports drops below a certain threshold. The team might be able to give you an idea of how it's currently doing in this regard, but I don't think anyone can give you an actual date. Agree! The World will as One. Wish there was a way to let the Duolingo creators know but then they would be flooded with letters. $3 (AUD) to order some top-notch keyboard stickers on eBay, it really makes things easier. I've done this. £2.00 UK on eBay. I have five keyboards installed on my computer and it is a real hassle having to change script each time the language changes in the exercises. I wish there were a way for it to select the right keyboard automatically. all vowels (both capitalized and not) with the diacricts ^~`´"
If you use windows, presss Alt+Shift to change you keyboards quickly. You will still have to press it a few times to get to the right keyboard, but it should be faster than switching them manually. That was actually what I was complaining about! Russian is my number 5 so I have to press it 4 times in a row, and then one more to get back to English. But if I forget whether to press once or four times, I end up lost and have to look and it's just a pain in the a. Until there is some magical automatic keyboard switcher (fingers crossed!) I'll make do with the hotkeys I found out how to create (Ctrl+1 for English, Ctrl+2 for Russian - much easier). Oh, I didn't know you could do that - I got rid of everything but Russian and English on my laptop because it was such a pain going through several. I shall have to look into hotkeys, cheers. It would be lovely if it switched automagically. It does that in the app and it's brilliant. If I could use the app without the too-easy matching/build a sentence from these words exercises, I'd be one very happy bunny. There are some tricks, like getting rid of English if another keyboard can double for it (for instance, Japanese keyboard types in Latin anyway, until you switch to kana). You can also install several keyboard under the same language and use a different shortcut to switch between them. I did it for Russian and Ukrainian keyboards, which now both live under "Russian", and I use Ctrl+Shift to change which "Russian" keyboard I use. I didn't know that. Спасибо! Oh, that's a neat idea, I'll look into it. how do you enable that in the app? I have to manually switch the keyboard each time. Eep - I don't know. My iPad has just always done it automatically. Maybe it's a system thing? I know the Amazon Kindle Fire does not appear, in my short acquaintance, to do it automatically. On the iPad, it switches between languages and has done since I started using it - not just Cyrillic versus Latin, but you get all the necessary accents and what have you for say German or Spanish or Polish or Turkish. It's sort of spoiled me, and makes the switching on the laptop seem positively cumbersome. The settings off the language toolbar - the dialog box titled "Text Services and Input Languages". It has a tab called "Advanced Key Settings" where you should be able to define hotkeys for switching keyboards. It will allow me to apply my definitions, but once I close the dialog, they disappear (no longer there when I return). Even the Left Alt + Shift default definition for toggling through the list doesn't work either. Does it let you use them? I've had Polish disappear from mine sometimes, but it still works. Thanks! I have to go offline now for a bit, but I'll give that a try. I think I'll also try just using "Ctrl +" for the hotkeys too. That's actually what I use. Ctrl + 1 for English, 2 for Polish, 3 for Russian, and 4 for French, though I don't usually use that one. Thanks again A_User! I haven't bothered with the Alt+shift stuff again, but I do have a set of four Ctrl hotkeys that work together. (The dialog box accepts them when you apply, but doesn't display all of them again after you dismiss and re-invoke.) Also, it appears that I cannot make my first choices of which keys to use. By trial and error, I just have to find four compatible ones that happen to work. So there's definitely something funky going on with Windows 7. However, I have a workable solution, for which I'm very grateful! Much less clunky! Neither of these seem to work on Windows 7, though. Every platform has its own idiosyncracies. I'm using Windows 7, and it works for me. Now I'm confused. Oh, ok. There must be something wrong on my computer, then. If it works, that's what counts. Where are you going to make keyboard shortcuts? Thank you! I was wondering how to get the on screen keyboard! Thank you, great tip! One problem; when I use alt+shift, the keyboard changes, but the on-screen keyboard sometimes does not:/ Anyone know how to fix this? On my laptop, sometimes it takes a second for the on-screen keyboard to refresh. Then you can just use the cursor to go to the first command and type enter. Folks who are using the awesome window manager can use the keymap_switch widget provided with the obvious widget library. Here is a readme for keymap_switch. Here I have the German keyboard layout, the US layout and finally the russian phonetic layout where the first string in every table is the string that will be later displayed in the menu and the second string is the command that will be later passed to setxkbdmap. Now go to the function set_layouts(layouts_table). Now save and restart awesome. That's it. This will set the caps lock key as a toggle, but there are many alternative toggles. I didn't really like the phonetic keyboard that came with Linux though, because it maps 'в' to 'w' instead of 'v'. Instead I created a new one based on my favourite Windows layout here. Thanks a lot cobold! You know, I was about to post the same thing about how to change the Russian keyboard in GNU/Linux using setxkbmap. Regards and long live GNU/Linux and Free Software community! I use the Windows 10 Russian Mnemonic keyboard, because it is closet to the English keyboard for many letters: English A = Russian A. Then Russian equivalent letters are entered using their English value: Russian Д = "D" is entered by pressing the D-key on the English keyboard. Russian Р = "R" by pressing English "R" on the Mnemonic keyboard. I suggest using the virtual keyboard on Windows (after installing the Russian Keyboard, of course) untill you know where every letter is. OMG I finally found the SCH, Щ & щ ! It was hiding way over on the top left under the ~ (eñe) key! I think I've finally found all the letters. For those of you who are having problems installing keyboards, or are confused where the letters on non-English keyboards are, russian.typeit.org works without installing anything. There's a little guide at the top of the screen that shows which characters go with which keys, so you just type your text out and then copy it into the answer box. .
See also a thread A quick Mac guide to Cyrillic keyboards. I haven't used this specific one, but I've used others like it for different languages, and it does help a lot and is very easily removeable. It's helpful to note that there are 2 types of mac keyboards, in terms of physical keys. A US version and EU version. The US and EU have different return keys. I have one of these bit only for English letters, you can get them cheaply on aliexpress. But I am not using stickers as I have the Russian letters in a red colour and the English letters in a black colour, I find this easier to distinguish between the two. However the specific one you linked on amazon looks good because the English and Russian letters are different sizes! I specifically have this Keyboard cover for my macbook, I love it. works quite well! Where can I find an AZERTY phonetic Russian keyboard? THANK YOU SO MUCH! At first I had been self teaching myself Russian (for a bout a year and two months now. So far I've only learned about %3 of the language and am just starting to recognize almost all of t he Cyrillic letters. ), so this was really helpful! Now that the language is learnable on Duolingo, I feel like I can learn it easier as I'm more used to his site than any other one. Up until now I've just been typing letters without accent marks and letting it count my answers as wrong, but now that there's this I know how to fix that. Thank you so much again! I'm a Windows user and it doesn't look to hard to change the keyboard, so I'll soon be working on the Russian course non-stop whenever I've got time! Thank you so much for this!!!!!!!!!! Shady_Arc, this Aa/Яя switch/button that you speak of, I cannot seem to find it on the mobile web version of Duolingo. So I am stuck with latin transliterations. Am I blind or is it only available on the desktop web version? Confirmed, the switch does not appear in the mobile web version for me either. If you change the setting in the regular version though, the change does carry across to the mobile web version. The Powers That Be at Duolingo HQ have nefarious reasons for not wanting people to use the mobile web app. I don´t use mobile internet and don´t see it... so...? My favourite phonetic keyboard layout for Russian is the the Slavonic Multilingual Phonetic keyboard layout, which I linked to here. It even supports some other Cyrillic languages like Ukrainian. (Shady_arc) "these layouts are just fine if you are moderately interested in Russian but that's it". I think you can even use these if you are fully interested in Russian. It's just a way to make things easier for yourself similar to how some people use Dvorak for English. First of all I want to say I've been watching this course since the very beginning. Always signing in to see if that percentage had moved up or down. I wanted Russian duolingo more than anything. And I'm so happy to see it here. Thank you so much to everyone involved, for your hard work and dedication. I've been studying Russian for a couple years but haven't gotten far with the language by any means, mainly because I've been doing it all on my own, no tutors or coursework, just listening to old Pimsleur tapes, watching Youtube videos, using flash cards, reading books, and trying to communicate with Russians whenever I might randomly meet them online. It's been a huge struggle, this language is a monster. A beautiful and wonderful monster but a monster. However I'll say that completely on my own, I was able to learn the Russian alphabet (Cyrillic characters) in maybe a week, tops. And I'm not a terribly smart person, I possess no special gifts and am of pretty average intelligence. Whoever you are, if you're reading this, you can do it. Unless you have some kind of actual learning disability or something... Basically if you've learned the English alphabet, you can learn the Russian/Cyrillic. It is by far the easiest part of this entire process. Because of how easy, people should absolutely not be crippling themselves by learning it with the Latin/Roman letters exclusively. Thankfully there's a switch at the top right of the page in this course for going between Latin and Cyrillic. For really easy practice outside of duolingo, try using Russian as a cipher for writing languages you already know, i.e. English if you're reading this. It may be silly and look like gibberish, but it will help. Ай ам талкинг абаут райтинг лаик дис. Ес, ит из ступид лукинг. Ат эни рейт ит кан би хелпфул фор лернинг, ор ат лйст ит вас фор ми. Granted, typing it is harder when typing when your English keyboard layout is so ingrained into you, but simply setting up the computer to do it is not. I used keyboard stickers for awhile and tried to type with the standard Russian keyboard. I was terrible at that, very slow, and I figured the only way I'd need to learn that layout in the first place is if I ever plan to go abroad and work, which I really don't, so I decided to go with a phonetic layout, and almost immediately I could type nearly as fast as I can in English. Many foreign Russian learners, even very serious and passionate ones, may never actually move to or hold a job in Russia. I think that's a very fair assumption. For visiting Russia, which I unfortunately have not, I see no reason why you wouldn't be able to set up your own computer while there and type Russian the way you are accustomed. When using other peoples' devices while there as a tourist, you could "chicken peck" and make it I'm sure, after all, the keys will be properly labeled and you'll just be looking down a lot. And if Russia is anything like the United States where I am from, if you had a clerical or office type job you may even be able to install software on your work computer at your own liberty. So in that case, all assumptions of course, even if you were there as a resident and were employed in a Russian company, you at least may still be able to use your student or phonetic keys. So really the issue of whether to use a phonetic layout or not seems to me to be a non-issue, and certainly shouldn't be the prohibitive issue in whether or not you learn the language. If the choice is learn in Roman letters, or not learn at all, or learn in Cyrillic but type in an improper layout, I think the best decision is obvious. Any chance to integrate an optional, small clickable virtual keyboard right above the textbox? I do not know the answer, but it may be less likely because the major computer operating systems mostly already implement software Russian keyboards for you, as far as I know. But the French and Spanish courses still provide language-specific extensions themselves anyway: accented letters, cedillas, etc. I do think it might be helpful just to have what is essentially an on-screen Russian keyboard there as an alternative. Such things do not make for quick typing, but I find the other keyboard alternatives clumsy too, including having to switch back and forth between answers, depending on the language you want to enter. Sometimes I think I'd just prefer not to be shifting gears all the time but go with the automatic transmission. It would probably be convenient, for myself as well. I suspect from the development point-of-view, they may be unlikely to devote time to it. I also think that if I wanted to move from a beginner to a more serious student, that I should learn to use the real keyboard tools of the operating system, so I can use them not just on duoLingo's webpage, but across everything. Maybe one day I will find the energy to become such a real student, but... sadly... it has not happened yet. Of course, I have no idea what resources it would take to develop an on-screen keyboard, but I suspect much of the underlying technology required is already there in DL. I'm also with you on using real keyboard tools elsewhere, but on DL one needs to shift back and forth depending on what language the questions expect. The clumsiness of that process affects how fast one would ever be able to respond in a timed exercise, which is already dependent on typing skills. I have not found a "phonetic" keyboard to be of any particular help. I'm making a point of learning to spell in Cyrillic, and am just not using transliterations. I expect that going that route will only prove to be troublesome later, affecting not only my spelling but my pronunciation. Call me stubborn, or a purist, but I'd rather trust to the methods that the Russians themselves have been using for so many centuries. Energy: now there's a critical resource! I have to keep reinforcing my vocabulary so much that I'm at level 5 but have only managed to complete 3 skills. So keyboarding will eventually prove to be small potatoes compared to other hurdles. Russian did not use PCs for centuries. As for what they we now, well, it is a ЙЦУКЕН keyboard and a shortcut to switch from Russian to English and back (on Windows, typically Shift+Alt or Ctrl+Shift). At least, that's what I have been using for almost two decades. Oh, yes, I've had that experience, though my keyboarding was not responsible. Still, anything that slows one down, other than actual fluency, does lessen the effectiveness of that type of drill. I don't see what DL can do, though, except to provide the best technical alternatives available, and in this case I think the biggest hurdles are not theirs to overcome. I'm afraid I don't foresee a time when I'll ever manage a timed Russian lesson that yields more than 1 correct answer typed in Cyrillic. Fortunately, with a language that takes a Latin keyboard variant, I'm able to do fine, because I can just use that keyboard for all answers. Oh, goodness, Shady_arc, what did you think I meant? Only that the alphabet has undergone centuries of application to new developments leading to what there is today! And I'm saying that I prefer not to ignore the experience derived from those developments. The big question there is how well Microsoft has done meeting the needs of the Russian language. (I am not a fan of their approach to software engineering.) And that may be reflected also in my opinion of the clunkiness of their keyboard switching techniques. I do have the Russian keyboard, and find it superior to the others for my needs, once I am settled there. Trying to map 26 letters into 33 or back again just gets confusing. And Shift-Alt sounds like an improvement, but it doesn't work on my Windows 7 installation even though it's supposedly there. Neither do the advanced key settings, and even the settings are not persistent between invocations from the keyboard toolbar. No easy way to keep up the keyboard layout for more than one language, either, and I'm shuffling among four. MS has a long way to go, in my opinion. And I guess that's why I'm looking with some favor at the notion of an on-screen keyboard, à la French and Spanish extensions. Is that a big task? Or is the question more about screen real estate? I don't use these tiny devices we have today. Older eyes don't like them. You're absolutely on point with the timed exercise scenario. I tested it twice only to end up with a FlappyBird-like experience. If you didn't get the Flappy Bird reference; I meant that I was able to answer two questions only, and then it was Game Over for me. A few accents versus 30+ letters is quite a big difference, I don't think it's really comparing like with like. Didn't mean it as a comparison, just as a starting point, hoping it might be extensible. This would be great, it would make everything is easier. Not all of us have the option of changing our keyboard for various reasons. I've been using the Bulgarian phonetic keyboard that comes with Windows just fine. There was no ASDF layout under Russian. It only has Ъ where it should have ы, so I'll check out the link above to correct that minor issue. Thanks! Hello @Shady_arc, congrats on helping the community with your personal time to develop the Russian to English course! I'm starting with the beta version, I was a little surprised because of the lack of Russian screen keyboard. I think it is very important for us learners to have access to the Cyrillic characters while learning. On the other Duolingo courses we have access to special characters on screen without having to change our physical keyboards layout, like for example the use of umlats on German. It would be great if you pitch the app developers to include the Cyrillic characters on screen. Keep going! There are lots of people around the world like me that we appreciate the work you guys are doing! I've got a simple solution that costs nothing if you own a smartphone. What my wife and I do is type using the Android Russian keyboard, piped to Plasma via KDE Connect if we want to use our Linux workstation. A similar solution might be to use the app of your choice to forward your keyboard to Windows, and I'm sure Mac/iOS can do something similar. This allows us to study several languages using native layouts while providing alternative keys easily and composition tools native to the platform including spell check reminders. Hope this helps you guys. Удачи! Maybe someone else could throw more light on this, but I've always thought that transliteration was more of a technique than a standard. Do actual full sets of standard transliterations even exist? I see that there are "systems", and automation methods, but those are standard techniques, not standards themselves. And of those techniques, it would seem likely that there would be at least one for each target language. As a classical musician, I have seen various musical terms printed in Russian (seldom Cyrillic) as musical directions on the scores, and composers' names too. We see Tchaikovsky and Prokofiev appear often on scores printed in English-speaking countries, but I've seen Chaikowski and Prokofieff often enough in foreign editions too. The choice makes the most sense when it targets first the language and phonetics of spoken my the most likely readers. (Which really makes me wonder why anyone has gone to the trouble to try creating an ISO system!?) Note how many of those listed on Wikipedia are tied to a specific language or alphabet. My guess is that DL uses a system that is closely tied to English in this course, and probably American English if there's a distinction to be made there, just because that's the standard DL approach to translation and teaching, the center of gravity for the courses. What the name of the system would be, I don't know. If you mean in general, in the scope of any language and writing system, then yes, standards definitely exist. A well-known and completely defined standard is pinyin. Thanks everyone! Good question, interesting answers. Helpful post! I use a mac and changed the default language selector to the apple key and 0 as for me I found it easier. So if any users can't get used to the default option you can always change it to something of your choice. For those of us using Linux (I'm personally using Manjaro Linux KDE [Arch Linux distro]); you do not need to feel alienated. First, add the Russian keyboard layout from the keyboard settings. Then install Florence Virtual Keyboard. It's quite decent. All the best. https://aur.archlinux.org/packages/florence/ ... To Shady_arc and all the Russian team who made the Russian course a reality, I just want to say большое спасибо! You can write a short guide if you wish. Then I can append it to the above post. I do not quite remember how I added keyboard on Linux (didn't have any problems with Mint). I simply navigated via the "Start" menu to Preferences -- Keyboard -- Layouts and then added (with the + button) the Russian (US, Phonetic) layout (which has mappings slightly different from those in the image above). The flag icon applet which appears in the lower right corner will, by default, still show the US flag when you're typing in Russian because the layout is QWERTY-based; to change it to display the more informative two-letter language abbreviation (i.e. "en" / "ru"), right-click on the applet, select "Configure", and de-select the button "Use flags to display keyboard layouts" (it's the only option on the Configure screen for me). When you left-click the applet, you'll have the option of calling up the keyboard layout in its own window (which I'm finding useful). If you want to change other options -- e.g. set hotkey combinations for cycling through input languages -- navigate to Preferences -- Keyboard -- Layouts and press the "Options..." button in the lower right corner. In any event, спасибо Shady_arc for all the amazing hard work you and the team did! This is great. I made both these changes in Xubuntu Wily Werewolf through the default keyboard settings. Much better than trying to memorize the Unicode values! Thank you for the suggestion. Remember though, that different distro flavors may have varying settings and GUI layouts. Anyway, I will make a guide for Manjaro Linux, and perhaps others may be able to adapt those instructions to their own Linux distro. Thank you. I use vanilla Arch Linux myself. Appreciate the recommendation on virtual keyboards. If you use Ubuntu or any of its derivatives, you can use Onboard as on-screen keyboard, as it's included by default. I already installed the phonetic one, the question is, does anyone know how to quickly switch from one to another? I tried alt+shift but didnt work. I found it. Thanks a lot. Maybe you do not need the other one any more. I switched ЙЦУКЕН off and use only the phonetic one. It makes easy the switch from standard keyboard. Yeah but I mean from Russian to english. OK. I'd bet lunch that the answer is "no" because if yes, it would be too wonderful not to have been mentioned here, but is there a way to get the web-based version of DL to auto-switch keyboards like the app does on my iPhone? I'm going to double-up here and ask if anyone has found key top stickers which they especially like (or to avoid!) to add Cyrillic to a standard keyboard? Automatic switching would be the bees knees. It's my main issue with the website versus the app. The app has automatic switching? No fair! Yeah, anti-virus would probably scream at me. :-) Would there be a way to set it up so that you could select whether or not you have a Russian keyboard installed, and if you do, then it switches automatically? Oh yeah - I see your point :-/ I wonder if it would work as an opt in feature? I realise this is a Duolingo issue, not a Russian course issue, though! Though from experience, what the app seems to do when you don't have the keyboard is just sticks with English. It doesn't always work perfectly (if I've been using the Russian course on the website and go to learn Esperanto on the app, I confuse it totally, and half the time it's offering me a Russian keyboard to type English and Esperanto, which for me is kind of amusing), but it usually does the job pretty well. I've discovered most of the time, using regular websites/email/etc, iOS is pretty good at assuming if you've been switching between Russian and English keyboards, that's what you want it to keep doing, but if I accidentally hit the keyboard button when I don't mean to it can get loused up, and of course, it's always when I'm attempting a timed practice! Does anyone know if there is a faster / more natural layout for Russian? I type with DVORAK and I love it (I can type 95wpm compared to 70 that I used to type in QWERTY before switching). DVORAK produced huge gains for me (and also completely stopped my carpal tunnel pain) and I think it did this because it concentrates vowels in the left hand and consonants on the right, with the most commonly used letters all residing on home row. The Russian layout seems pretty inefficient, like И, Н, and Т are all very common letters and all involve diagonal moves off home row, whereas Ф and Ж, for instance, are taking up precious space on the home row and are much less commonly typed. Also a lot of common combinations (like А/М) are next to each other vertically, leading you to type them with the same finger, slowing you down. Now seems like a great time to learn a fast layout, start off on the right foot instead of having to relearn something new later. Never heard of them but you can create the one of your own. It is pretty easy these days. I would love to find a Dvorak or Colemak-esque keyboard for Russian. I use a French Dvorak and going back to Key-randomized layout is a pain to the hands. In ЙЦУКЕН, the most frequent letters are in the center so you could type them with your index fingers - which are faster and more skillful than your pinkies. I created my own layout with Dvorak as a base - here's a link to the .zip file of the layout installer in my Jumpshare account: http://jmp.sh/v/XHIfoCWuy2la444nZsfc The layout is a little weird with some characters (you'll definitely want to check the on-screen keyboard), but if you have another layout editor, you can tweak at will. I haven't found any equivalent in Russian-based keyboards, but for me, it was such a crazy step to learn Dvorak that I'd rather use that if I can. With this, I can touch-type in Cyrillic. I've already learned the йцукен layout beforehand and have no real trouble typing with it on windows. However, when I'm on my android device, I've noticed the default russian keyboard does not have a Ё-key. Do you know of any way to type this on android devices? In the Russian keyboard layout on Android, long press the letter "е" and wait for a second or so. "ё" will shortly appear thereafter. While still pressing, slowly move your finger towards the letter "ё". That said, it would be useful to be able to continue to use the Aa/Яя button at that point, (during the exercise result display) and I'd love it if that could be fixed. Maybe megzaela is using the mobile website. The period should be to the right of the ю key. Possibly also comma with shift. For those using the phonetic keyboard in Mac OSX, I have both a tip and a question. Tip: to make the letter ё, switch to the Russian keyboard and use Option-e. Question: While in the Russian keyboard, how do I make the quotation marks like «this»? In the normal English keyboard, it's Option- and Option-Shift-\, but I can't find it when in the Russian one. Has anyone figured this out? Hello. For the keyboard I'm using (the phonetic ЯШЕРТЫ keyboard for Mac), I just click Alt+О for « and Alt+П for » :) I don't know how to do it on the ordinary layout, but you can check by using the keyboard viewer tool. I'm wondering if it could be changed so that it's possible to switch between the alphabets after a question has been answered? I don't see any way to switch the lessons to being in cyrillics. The Aa Яя button doesn't exist. I am on mobile safari on the iPhone. Please help. If you can load the website on a larger screen, you should be able to start a lesson in the desktop version of the site, and change the display mode. Once you do that, the change should also take effect on the mobile version. I'm using the Google Input Tools on Chrome (phonetic keyboard: Русская клавиатура (фонетический)), that works very nicely. It's easy to switch between English/Russian by using Ctrl-G. This even works with non-QWERTY layouts, such as Dvorak, for example, typing "dobroe utro" will result in "доброе утро". Why I still dont see Russian on my Mobile app. I don't think it is released for Mobile yet. Mobile doesn't have all the languages. Would it be possible in a future revision to have the Russian keyboard pop up whenever it is necessary to type Russian so that you could point and click the letters (using Windows OS)? On the German Duolingo, the special characters come up like that. Many thanks to the team for the huge effort involved in the launch! I was confused about which type of keyboard I should use, thanks to this post I have found my answer. ЙЦУКЕН all the way. If you're on a Linux machine, install the program "onboard". It's a well designed visual keyboard that pops up, and you can see the letters of the current keyboard layout. It's really helpful for those that haven't learned where every key is. How do you get it to recognise the russian layout? If I have my Russian layout active when I start it, it automatically reverts to the US layout. Changing layout while it's active doesn't change the displayed layout. I have the command "setxkbmap -layout "us,gr,ru" -option "grp:alt_shift_toggle"" in my .bashrc. But since it fails now and then to work, I have it also in a script called "keyboard" which I run if it doesn't work from the .bashrc. It's a nasty fix, hopefully I'll find the root of the problem soon. Seems fine to me, but you can also just set it once with localectl. By the way, I think .bashrc is only run when you open a terminal or login on tty first. So perhaps put it in .xinitrc or. xsessionrc. If you use Gnome for example, then check in the settings if there is a way to automatically run stuff on startup. It gives me the standard Russian layout (ЙЦУКЕН). It runs ok on LXDE, not sure what it'd do on Gnome.. The alphabet switch button and the tips button bony show up on my phone in portrait mode but they do show up in landscape mode. It took forever to find it. Also, a lot of the tips and explanations only use the Russian alphabet so I can't understand them... any chance they could be bilingual like the exercises? I've used the website http://russianlearn.com/alphabet to focus on this subject, and found it very helpful. In addition to sdr51's website, you could try russianlessons.net and mylanguages.org. I used those and found them very helpful. 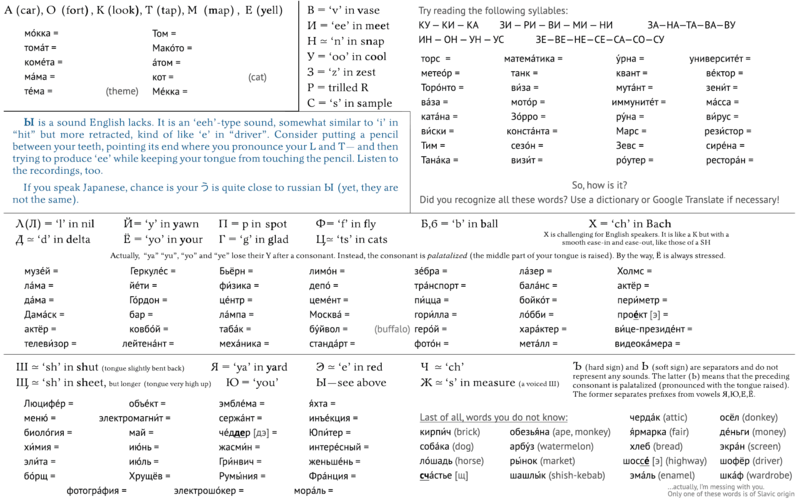 Also, an easy and free way of learning the Russian (Cyrillic) alphabet is to use Memrise. There are a couple of Russian alphabet courses on Memrise. Check it out people! There is a place called keybr.com that lets you learn how to type in many languages, including Russian. I never bought any stickers: just practiced there at the beginning, then started to write on my own on Duolingo/Google Translate and my typing speed and accuracy have dramatically increased. Are you going to make a course where it teaches you how to write? I have seen in almost all languages that I'm learning at Duolingo, that there are buttons with letters special to these languages, so that we don't have to install and use that language's specific keyboard. Namely, I as a Serb, writing in Serbian Cyrillics alphabet, as well as many others East European people, already using and having cyrillics keyboard. We would prefer these buttons, much more than installing and adjusting ourselves to an additional Cyrillics keyboard. All, what we need are 7 letters ё,ъ,я,ы,ю,э,й,ь specific to Russian cyrillics alphabet. I would love to see anglicized spelling given with the Cyrillic, or at least have the option to turn such a feature on. On my phone, there's no easy way to switch quickly between keyboards. It's a three click process that can get VERY old VERY fast. I've taken to using a cheat sheet to spell the Russian in anglicized text, but it would be much simpler to simply learn the anglicized forms with the Cyrillic. I've also found that seeing the anglicized with the Cyrillic greatly improves my pronunciation. This way the technically changed would have a quick and easy way to get the right input. It's harder to get used to the keyboard than learning the alphabet! I am now just learning. Who knew it'd be so fun? I type, then copy and paste from there. That sounds like a nightmare. Just use the Duolibro extension. It automatically changes the language for you. I gave the program a try, and it is awesome. Since I learned the Russian keyboard layout, I just type away during the Duolingo session and the program does the job of knowing which keyboard I should be using. Thanks for letting me know about this program. I'll give it a try. Hi I have created a browser plugin to change the keyboard layout automatically. An optional layout of that keyboard can be shown to assist in learning the layout. For Russian I included several different layouts ЙЦУКЕН (JCUKEN) and several phonetic layouts. Thanks I’ll give it a try. Thank you! So very helpful. i love the Cyrillic script, so different yet the same! The when I started the alphabet lesson, none of the lessons actually have Cyrillic in them, all the words in the lesson and in the description are romanized. Is that a bug or is it deliberate? When you are in a Russian lesson or practice, look in the upper left corner of your window, next to the Tips and Notes, and you will see a circular button labeled Aa (for Latin text), and another overlapping it. Click that one and you will see the label Яя (for Cyrillic), and all the Russian in your lessons will turn to Cyrillic text. Is the button available only on the pc version? It does not appear on my android phone.. It is available on the full version of the site. I did not need to install a language, it was there in the list when I clicked "add" in the "text services and input languages" window. Didn't know I could do it without installing. On-screen keyboard in windows changes to russian after clicking apply, although you need to close and open it. It does not change the actual keyboard. However, it changes back to english automatically after typing in a window like this one. So I can't use it. What needs to happen is duolingo has an on-screen keyboard like google translate has. Google translate actually also does auto switch the keyboard according to the current input language within the website. So for duolingo this should be also possible and it would be the fastest. In any case it is best to learn typing without watching at the keys so you can concentrate on the actual task instead of looking for keys and letters. You may wish to replace your ЙЦУКЕН-keyboard pic with the one that includes Ё.
Wow! This is really useful! You deserve a lingot! Hi, dear Russian course builder, I think when this course out of beta, this part should merge into the course, not only a thread in discussion, but also become a preparatory lesson to the newbie before the formal study. However we use the keyboard to study a foreign language on this website. "How to type the right letter" is very important to me. Thank you. Very clear explanation, thank you so much Duolingo. I believe you need to go to the full version of the site to switch it, and then it will stay on Cyrillic. Alternatively, if you switch on a computer and then use your Android, it's supposed to switch on the phone as well. Thank you- that is what I did successfully. Thank you for your help! I can convert my keyboard to Russian without a problem, but everything that I have seen so far from duolinguo has used the Latin alphabet. Does duolinguo not use Cyrillic? I really need to work on my spelling, and the best way to do that is by using Cyrillic to write Russian. If you look at the top left corner of the lesson panel when running duolingo on a desktop machine you'll see a toggle labelled Aa. If you click on it, it should change to Яя and the Russian course should then use the Cyrillic alphabet across all devices. For future reference though I recommend reading the thread before posting. This has been asked and answered several times. Is there any way that I can take the tests in Cyrillic Russian and not Anglicized Russian? In the lesson, in the upper left corner by the Tips & Notes button, there's a switch. It shows Aa when on English and Яя when on Cyrillic. Clicking that should change it. In the future, please read the thread before posting, because frequently the question has already been answered at least once. Thank you. I was wondering how everyone else on the Russian comments were typing in Russian. It may be slower, but I am using a web site for cyrillic input. Sorry, but I think this course is pointless unless the text comes in cyrillic. There could be duplicates in latin under the cyrillic text for beginners. You could include a cyrillic keyboard under the text box (like in google translate). I think one must be able to think in the original alphabet. The course does come in Cyrillic. I use Cyrillic on my phone app. You have the choice to switch between Latin and Cyrillic. Different learners, different goals. Someone might be approaching Russian from a conversational level, wanting to speak with another, but not necessarily read Russian. It's an A4 glance-sheet of the alphabet, with pronunciations (both stressed and unstressed) and English examples underneath each letter. This, too, is very good for learning to type the alphabet: http://www.keybr.com/#!practice . You can change the keyboard layout to Russian, as the number of keys it tests you on, in the settings. Hello I have found the solution to my problem, thank you!!!! For most English or west European language speakers who are fast touch-typers, there's a much easier and faster method. Just keep a separate browser window open to a transliteration utility such as translit.cc, type the sound equivalents into the conversion window, then cut and paste the transliterated Cyrillic into the duolingo window. For example, in the transliteration window using your normal Latin keyboard (I use QWERTY, but works just as well if you use AZERTY, QWERTZ or another one) you just type ' horoshij zhurnal' and then you copy/paste the converted "хороший журнал" back into the Duolingo window. For additional speed, use shortcut keys and a separate browser window to type the Latin, select/copy the Cyrillic, switch windows, and paste the result (on Windows, that sequence is Ctrl+A, Ctrl+C, Alt+Tab, Ctrl+V. I'm really enjoying learning Russian but I realised I'm only learning conversational Russian in Latin script. Would love it if there were bonus skills teaching Cyrillic. Also I have a peculiar problem that when I use the app all the lessons are in Cyrillic but when I access the mobile site it's in Latin script. wonder if it's something that I've missed our something in the app..
You can change between Latin and Cyrillic on both the app and the website versions. What small button on the top of what? My kindle doesn't seem to be able to sync with Running so I have to just use latin. I believe I may know the Cyrillic alphabet l to type in that, but am unable. Yes, mine is a fire, I realize that there are few answers that do apply to the Kindle. So I will just have to do my own thing. I do not want to buyi a keyboard for it! Thank you for your willingness to help. There are so many dedicated people giving their efforts to this site. I love it! I have tried it a couple of times and have not been successful. I am just going to have to apply more diligence! It says in my settings that I can do it. Thank you so much! There is also on screen keyboard (windows 7 user here). You can add russian keyboard to your computer and open on screen keyboard. Is it useful for learning all the cyrillic alphabets (Bulgarian, Serbian, Ucranian, etc)? Thanks! Thanks! I would be using the Russian keyboard add-on, but I can't switch it back to English. I'm extremely happy that the Russian course is finally available, but on the android app it defaults to cyrillic for me whether I'm using an english or cyrillic keyboard. Is there any way for the lessons to be presented in Latin transliteration instead of cyrillic on the android app like it is on the PC web version? Hi, I just started Russian 2 months ago but I had to restart because I was having a hard time with the alphabet. I accidentally set the writing into Cryllic instead of Latin. How would I change it back to Latin on the app? Hi, Could you please provide on-screen keyboard like for modified latin signs in other languages ? It would be so much easier than switching the keyboard. At least for the beginners :) I have issues with switching keyboard language on my laptop from sentence to sentence. That will not happen in the foreseeable future. I'm brazilian, how can I learn russian effectively? Any tips? One thing that might confuse people who are learning Russian (it did me) is when they see Cyrillic in italic letters. Many of the letters look different because they are based on the cursive alphabet. In particular, Cyrillic Т looks like English M. I'm learning to read and write cursive now. It would be good to have a table somewhere that showed the printed italic forms, and maybe the cursive forms, of the letters. Thanks, I've gotten pretty good at reading it now. I'm still working on my handwriting. There are videos on YouTube showing how to write in cursive, and you can download worksheets. Thanks! I'm working on one language at a time. When I get to Russian, I'll refer back here. I appreciate what you've done! Is this the place to come if I want to learn Spanish? It's the right website, but you've wandered into the Russian discussion area.Go back to Duolingo.com and try again. why do people have the most hilarious profile pictures? I am having a hard time with all of the letters and language. Romanian is easier for me. Romanian language is never easy for me as Russian is never easy to learn, either. Oh my gosh, I need this phonetic keyboard. THANK YOU! I was stuck doing Duolingo on my phone before and that was okay but the web version is so much better! One of the best things I ever did was learn how to type in Russian (without looking). It makes learning so much easier. If you know how to type in your own language, I recommend that you print a copy of a keyboard with Russian letters and lay it NEXT to your computer. Without looking at your fingers, only look at the sheet and type by feel. In no time, you'll be typing in Russian without even looking. I also have a keyboard "skin" in Cyrillic that I got from Amazon. I don't want to add stickers to the keyboard. I've the question: how to input the letter 'soft sign' (мягкий знак, https://en.wikipedia.org/wiki/Soft_sign ) using the transliteration answering the exercises? If I understood correctly, it should be single quote. I've tried ' (hex 0x27) and ’ (0x92) but both are not recognized as matched and I still have errors. Please let me know how should I input the words with soft sign as answers. http://russian.typeit.org/ Is an online Russian keyboard. Just type in the letters that you would use in latin script and hey presto! If you are learning more than one language with more than one script then this will help tremendously. thank you, it helps a lot but are these the sounds that they make too? thank you a lot. It is very useful, keep it up! Hey I'm am in the beginning and it keeps showing me the words and English and then all of a sudden it expects me to write with the Russian alphabet. How can I change it so I am seeing Russian and learning it that way?? I find it easier just to use the keyboard at http://winrus.com/keyboard.htm and then copy and paste it into the DL answer box. I learned Russian alphabet at https://www.youtube.com/watch?v=vIi05c5lbbk. I need 2 hours. After that, I start writing on the normal keyboard and after one week of training, I used to write in Russian. Writing in Russian is now for me the same as writing in English. Wow. It is very helpful !! Thank you so much !! yeah, seems the button has been removed? Thank you for your help. I am waiting on cyrillic stickers for my keyboard and hope to manage the course better with them. You can also go to Accesibility settings and display the keyboard. Works especially nice on Ubuntu as the keyboard is in the lower part of the screen. Don't see any button and can't get any of this (above) to work. However, I found this online keyboard: http://russian.typeit.org/ Typing in Russian there and copying the result into Duolingo works for me (on Windows 10 laptop). I'd recommend it especially to beginners who (like me) aren't even sure yet how far you want to go with this language, but would like to try out a few lessons without the hassle of downloading a special keyboard or getting stuck on some of the lessons. I haven't even started playing Duolingo yet. Still trying to get the hang on the Alphabet! Where is the comma on a Russian keyboard? I have all the stickers on mine and no comma! I have been toggling back and forth between English and Russian, but that's crazy. Thanks. On the Windows Russian keyboard it's the shifted / key, the same as ? in the English keyboard. You can also get it from the number pad if you have one and the Num Lock is enabled. i used msklc to create my own keyboard layout which i now use for these lessons. i already know Cyrillic alphabet as we use it too, although ours is phonetic, unlike russian, so i matched our latin and our cyrillic characters as they are, and placed additional characters that we don't use, such as я ю ъ ы ь щ ё э, on top of latin characters that aren't used in russian, or aren't phonetically related to russian characters, such as q, w, y, x, ć, đ, ,, ., and i'm really satisfied. I do think the russian keyboard layout makes more sense than qwerty layout, as it has more common characters, such as "a" closer to the middle of the keyboard, so that you are expected to type them with your index, and middle fingers, instead of having to pres on them hardly with your weak fingers like pinkie and ring finger, but i don't see the point in learning a completely new layout now, since i'm completely familiar with qwerty. i'd just like to complain about all the answers being marked as wrong, cause while translating from russian to english, i forget to type down the articles. I'm trying to learn russian, not english here, so marking my answers as wrong because of english articles, seems both mean, and useless, and is extremely frustrating. it's completely different thing to already speaking english, when you'd naturally use articles, but having to translate a language that doesn't even have the concept of articles into english, and being molested with articles, is an utter waste of time. i'm bilingual, and i can't really translate between two languages i speak, but i can speak both of them with no issues. reason i can't translate between them, is cause it takes so much time to think of the right word each time, as my mind simply locks into the language i'm trying to translate from, and i can't really focus on finding the right word in the other language. translation, it's completely different beast than fluency, so making a big fuss over missed article really doesn't make any sense, unless you're learning english, or german, or another language that uses articles. another big complaint i have about russian course, is how there are bunch of words introduced early on, that don't really feel useful at all. the similar problem is observable in japanese and korean, and especially in korean, where you have to type nonsense like washington, hyundai, samsung, baskin-robbins and so on, which are really the words you don't have any use for if you're trying to communicate in korean. examples of useless words (fr a beginner) in this russian course here, would be рюкзак, тетраедь, радио and above all цирк. rather than teaching us words we might have an actual chance of using, we end up learning цирк? I don't think i've run into a single sentence using цирк, other than где цирк. i mean fine, there's no reason not to know word for circus, but in and intermediate level, not for an absolute beginners. sorry, sorry, i meant to say word for the circus, my bad. I mean, russian is already hard enough, there's no need to make it more difficult by articles and nonsense words. I have installed the phonetic keyboard that my school provided me. It's very useful because I had few problems. Most of the letters are the same, I had to search for letters like ь, ъ, ч, я, э, ё and ю but now they are easy to find. Like ё stands on the é and э stands on è. The only thing that frustated me at first was that I constantly typed c instead of s because c means s in Russian while my phonetic keyboard transcribed it as ц. But after a few hours of practice you'll get used to it. Also, we have to use this keyboard so we can easily put the stress accent onto letters to memorise the way words are pronounced. Thanks to this discussion I now am able to type in russian! Спасибо! I was wondering how you could access a Russian keyboard on a kindle fire. Any advice would be helpful! Thank you. I think, it's explained here. I hope it works for you. Swipe down from the top of the screen and tap Settings, tap Language Keyboard, and then tap Keyboard Language. Select your preferred language from the list that appears. Or, to download a new language, tap Download Languages, and then tap the language you want to download. To remove a keyboard language from your Active Keyboard Languages list, tap the checkbox next to the language. • Note: If you're downloading a keyboard language for the first time, you will need to accept the Terms of Service before you can download the keyboard. • Tip: When you're using the onscreen keyboard to type, press and hold the Spacebar on the keyboard to switch between languages. I struggled with this for a while, but now I just switch to my ipad whenever I'm learning Russian. The app always shows the appropriate keyboard. Russian Phonetic Keyboard on macOS High Sierra today. Switching keyboards by short click on Tab key. Enjoy! Guys, this is totally outdated now, but the instructions on how to switche keyboards still point to this page. The info by @Shady_arc may still be valid for PC, but for mac everything has changed and it did about two years ago, when OS X El Capital 10.11.5 was released.... Check https://www.youtube.com/watch?v=inFAAozaq80 to figure out how it works now. I ran into this problem too and looked it up for Mac users. The ë letter in Russian was harder to find but it is the key above "return" with the vertical and diagonal lines. Mac has its own punctuation as well: Shift-5 is for a colon, Shift-8 is for a semi colon and Shift-2 is for the quotation marks, Shift-6 for comma, and Shift 7 for period. But I just ended up trying the different keys for the semi colon and colon as I practiced typing, with a bit of choice words at times. The trickier one was the little ъ, not the ь, because it's awkward to reach. I'm glad the numbers are the same! Hope this helps! why doesn't Duolingo just put up letters under the bar-thing like they do with, Esperanto, French, German, Spanish? I'm not sure why they don't but I found that actually using the alphabet, without pop up letters, has helped me learn the alphabet as well as not having all the typos I had when I used a phonetic version with the Latin alphabet. Not sure if this makes sense. Hola, debería poner caracteres especiales del alfabeto cirílico (ruso) en cada una de las lecciones como lo hacen en alemán. Sería más sencillo para los aprendientes. Gracias. I'm learning Russian Right now and this is helping me learn to speak to my relatives! I want to encourage the learners to learn to type blind, without sticking symbols on the key-board. By using a chart at first to locate the positions, I managed to type blind in 4 hours time. I did this by rewriting all sentences that I learn, immediately in a Word document after each sentence when they occur. Hey! I'm trying to learn russian and I cannot figure out which dialect to choose from on my samsung phone. I choose pyccknn and then it asks me for 6 more different dialect options. I guess I'd just like to learn the most common? Could any one help me with this? As native I am actually confused since we don't really have dialects (officially, at least). What options your phone offers to you? many of the extra letters are mapped to punctuation keys. how do I type a question mark - for example - without changing keyboard layouts back and forth all the time? For specifically question mark you should use combination "Shift + 7". It will work in same way for other symbols stacked with number keys, and works same for dot/comma key.